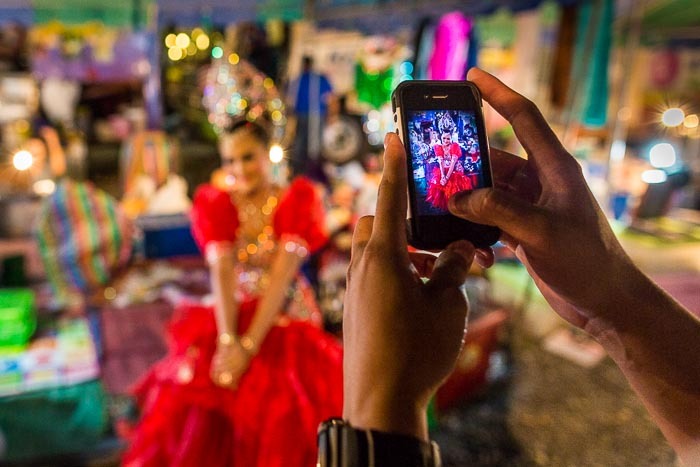 Photographing life in Southeast Asia. 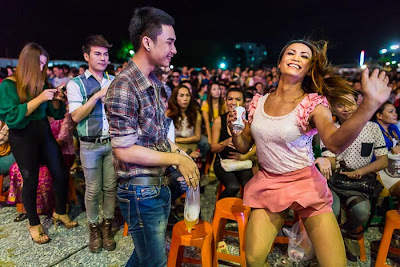 People from Isan dance at a Mor Lam show in Bangkok. One of my goals since coming to Thailand in 2012 was to do a project on Mor Lam, which has been called Thai country music because it originated in northeast Thailand and Laos. Mor Lam is still a music style and you can buy Mor Lam music CDs in record stores (they still have those here) and markets but the Mor Lam live shows have become wild extravaganzas that are a cross between Chinese opera (they tell a familiar, traditional story through song) and Las Vegas spectacle with comedians, stand alone music acts and costume changes. Shows last four or five hours and the audience drinks, dances and sings along the entire time. A Mor Lam performer on stage. The Mor Lam shows I went to for this blog entry and these photos were about the most fun I've ever had in Thailand. 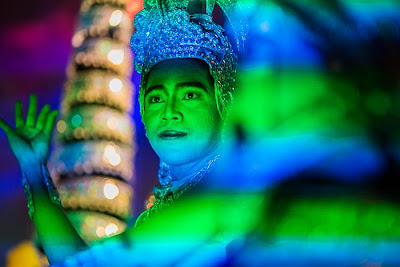 The Mor Lam troupe, which is based in Khon Kaen, Thailand, gave me unlimited backstage access before and during the show. When I wanted to go into the crowd to photograph the audience singing, dancing and tipping performers I was told to walk out on stage and jump into the crowd. Which turned out to be the only way to get to the crowd. A fan photographs a Mor Lam diva with his cell phone. Mor Lam is an Isan thing. It was born there, it's sung in the Isan language (which is a dialect of standard Thai and not always understood in Bangkok) and the stories are stories of Isan. Migrants from Isan make up the muscle that powers Bangkok. Isan people are the taxi drivers, construction workers and factory workers of the Thai capital, so Mor Lam has a following here. The Mor Lam troupes (there are a couple of hundred of them in Thailand) seldom tour beyond Isan. They play in Bangkok only a couple of times a year. As a result, the Bangkok shows draw thousands of people. Folks from the countryside who don't get to see their Mor Lam come to the shows and, just for the night, can imagine they're back in Isan. To show their appreciation fans call out to performers and slip small tips into their hands - anywhere from 20Baht (a little than .60¢ US) to 100Baht (about $2.90 US), it's not much but for people who make only 300Baht for the day, it's still significant. Performers put their makeup on before the show. Finding Mor Lam shows in Bangkok is hard. There aren't many that come to the big city, they're not advertised in the English language media and they're held in places that are a little out of the way. Just the same, it's worth the effort to find them. 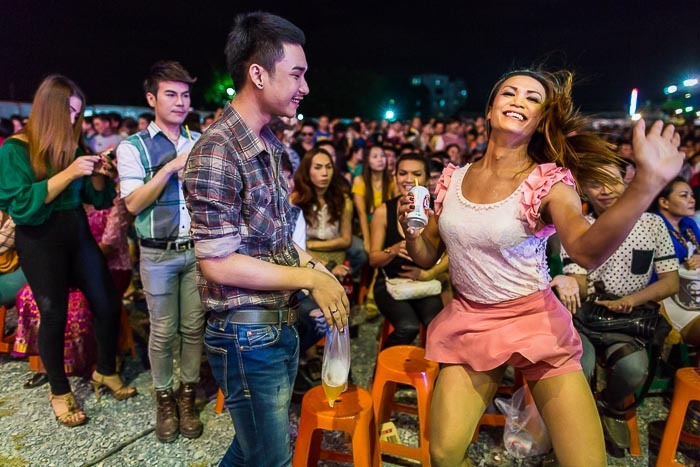 Going to a show is like cracking open a window into a side rural Thai life that most foreigners here never experience. There are more photos of Mor Lam in my archive. Finally, most of the photos in my archive are available for editorial use or self fulfillment as prints. If you see something you'd like to use or just hang on the wall, click on the "Add to Cart" button and follow the onscreen prompts. My work, from Southeast Asia, the American West and Latin America, is in my archive and available from ZUMA Press. Where in the world am I? All images and text © Jack Kurtz. No copying and reuse without permission. Simple theme. Powered by Blogger.